The group at the left is the Five Keys, featuring the great Rudy West (top). The other members of the group were Joe Jones (bottom), and center (l to r) Ripley Ingram, Dickie Smith, and Maryland Pierce, who also sang lead on some of their songs. Some of my other favorite Doo-Wop groups are: The Harptones (Willie Winfield), The Crows (Daniel "Sonny" Norton), The Flamingos (Nathaniel Nelson), Sonny Til and The Orioles, The Cardinals (Ernie Warren) and The Moonglows (Harvey Fuqua). What's up with all the bird names? 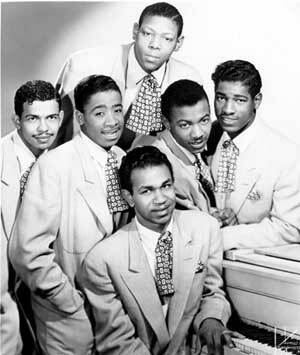 The term "doo-wop" was taken from the ad-lib syllables sung in harmony in doo-wop songs. Two songs in particular may lay claim to being the "first" to contain the syllables "doo wop" in the refrain: the 1955 hit, "When You Dance" by The Turbans, in which the chant "doo wop" can be plainly heard, and the 1956 classic "In the Still of the Night (I Remember)" by The Five Satins, with the plaintive "doo wop, doo wah" refrain in the bridge. This is an interesting observation that I found on the DOO WOP NATION Web site: they make the claim that "It's Too Soon To Know" by Sonny Til and The Orioles was the first record of the age of vocal group harmony. It all evolved from this recording. The former Vibranaires from Baltimore made it all happen in 1948. The impact of this recording and the subsequent releases on the Jubilee label cannot be over emphasized. The smooth delivery of Sonny Til, the warbling harmonies behind him, and the alternate leads of George Nelson influenced a generation of singers. The proliferation of "bird groups" named to approximate the style and substance of this group gave the music a foundation and a place in history. They took what the Inkspots originated and moved it to a new level. By the time "It's Too Soon To Know" was ending its run the word was sent forth – this was the beginning. I think the first doo-wop record I bought was "Speedoo / Let Me Explain" by The The Cadillacs.The record first hit the Billboard Charts in December, 1955. I probably bought it in 1956. I still have the record – it looks like it was used as a frisbee. I only wish I bought more of the records listed below, and took better care of them. These are my Top 30 Doo-Wop songs. You can listen to the first 3 by clicking on them.